When Miranda Massie ditched being an attorney to launch a museum, climate change had everything to do with it. Five years ago, the thought was aspirational. Now, the Climate Museum is official—its first exhibition opened December 20 in New York City. 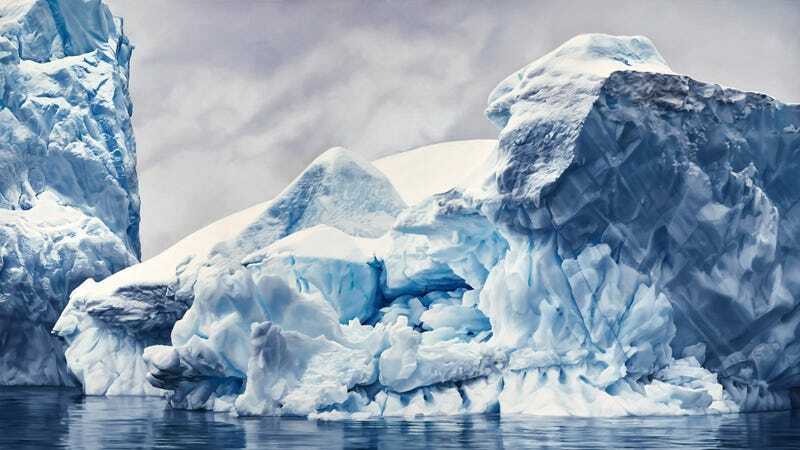 The two-part installation, called “In Human Time,” takes a look at the state of ice on our planet: first in Antarctica and then the Arctic. “There’s an intimacy to the work that is important,” Massie, the museum’s founder and director, told Earther. The first part features an intricate pastel drawing by Zaria Forman, a large-scale artist. A time-lapse video accompanies it to show the small markings she makes that give the piece that photographic feel. The exhibition is set to run through January 15 on a window display at the Parsons School of Design on Fifth Avenue. “One of the challenges that human beings face in confronting climate change is that it operates within timescales and space scales that we did not evolve to encompass, so it’s very hard to relate fire blazing in California to weird blizzards in Texas,” Massie said. She hopes that showing the time and dedication Forman put into making this art piece will help people “dislocate our sense of time a little bit” so that they connect with the larger time scales in which climate change operates. The exhibition’s second installation will have a stronger science angle that’ll dig into the Greenland Ice Sheet’s history. Visitors will be able to enter the museum’s temporary home at the Parsons School of Design to view images of the sheet’s ice core. Peggie Weil is the artist behind this piece. A multimedia artist, Weil created the film that the museum will show during this exhibition. The museum has a long future ahead of it—or at least that’s Massie’s goal. The museum’s full realization involves a four-part phase, and phase two has only just begun. This will entail building out its base, showing the public what sorts of exhibitions the museum will feature. Then, after a couple of years, the museum will hold a lab of sorts at a semi-permanent location to prove why this museum needs a dedicated space, Massie explained. “This is a breakout year for us, in terms of laying out developmental steps,” she told Earther. A forever home requires a full staff, some serious cash—especially in New York City—and a clear content message. So the museum is taking donations and is going to be applying for more grants this coming year. Until the money and mission are where it needs to be, Massie will be using loaned and public spaces (like Parson’s) to give the public a taste of what’s to come. She’s proud of this first exhibition but wants visitors to know that this first installation does not fully capture what she hopes the Climate Museum will become. She wants future exhibitions to feature more explicit notions of inequality and the disproportionate impact climate change will have on island communities, Native people, and the world’s poorest. The museum is already thinking about a future installation on urban resiliency planning both domestically and internationally. “In addition to being an overriding existential challenge,” Massie said, “I see [climate change] as being the equality issue of today. New Yorkers can view this exhibit through February 11.